Founded in 1947, the Festival rose out of the ashes of the Second World War to provide 'a platform for the flowering of the human spirit'. Its most visible flowering, in August at least, is now 'the Fringe', formed the same year by actors denied space at the Festival by the International Festival's first director, Sir Rudolf Bing. The first of its kind, the International Festival has inspired countless others outside Scotland. It is supported by Edinburgh locals and visitors alike, and takes place in some of the largest spaces across the city, including the Usher Hall and the Playhouse. Unlike the Fringe, the International Festival is a 'curated festival': its artists and companies participate by invitation only. As such, it prides itself on the internationally high standard of its performances and exhibitions. It incorporates classical music, theatre, opera, dance and visual art, and events are often focused around an idea chosen by the director. This Festival certainly earns its 'International' label. Characterised by its balance of countries and cultures, the International Festival is the place where audiences drawn from all corners of the planet can appreciate the world's best art. For many members of this diverse audience, the International Festival provides a first taste of Scottish culture - something that its directors over time have championed. The end of the International Festival is marked every year by an extravagant Fireworks Concert. 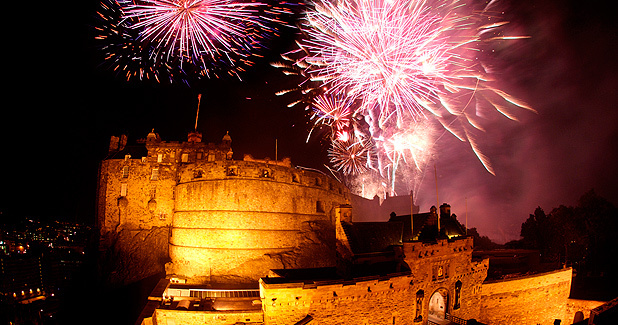 Colours explode against the backdrop of Edinburgh Castle, the Scottish Chamber Orchestra accompany the bangs and whizzes - crowds can buy tickets for the concert inside Princes Street Gardens, or gather on the hills and rooftops across Edinburgh (for free).